In March 2013, New American Notes Online (NANO)—an online, open-access, peer-reviewed interdisciplinary journal—invited Jentery Sayers and the MLab to act as guest editors of a special issue titled, “Digital Humanities, Public Humanities.” The MLab team circulated a CFP in May that invited submissions speaking to “how, when, and for whom digital humanities is also public humanities.” Preference was given to project-based submissions that explored the intersections of technology, computation, critical theory, and social justice. In particular, multimodal pieces across text, image, video, and audio were encouraged. As hoped, proposals were submitted from across the world and from a wide array of disciplines. After peer review, seven articles were accepted for publication. Each of these articles was then edited by an MLab researcher, with Alex Christie, Jana Millar Usiskin, Jentery, and Katie Tanigawa ultimately co-authoring the issue’s introduction. 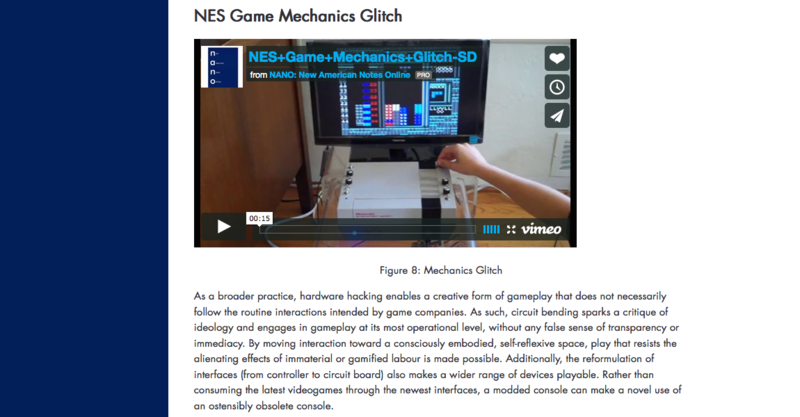 Among the published articles was Nina Belojevic’s essay, “Circuit Bending Videogame Consoles as a Form of Applied Media Studies.” In September 2014, Nina became one of the MLab’s assistant directors. The guest editors for the issue were MLab members, Adèle Barclay, Alex Christie, Jentery Sayers, Jana Millar Usiskin, and Katie Tanigawa, with feedback from Stephen Ross. NANO founding editor, Sean Scanlan, along with Assistant Editors, Rebecca Devers and Ruth Garcia, also contributed to the issue. Alex, Jana, Jentery, and Katie wrote the introduction to the issue. Other contributors to the issue were Rachel Arteaga, Karl Baumann, Benjamin Stokes, François Bar, Ben Caldwell, Nina Belojevic, Sam Byrd, Jimmy Ghaphery, Elise Chenier, Michelle Habell-Pallán, Sonnet Retman, Angelica Macklin, and Elizabeth Alice Honig. NANO is supported by the New York City College of Technology.